Read the bios below to get to know our Mentor Officers. Originally from Lexington Mississippi, but raised in Los Angeles, Officer Patterson has been on the job for 8 years. 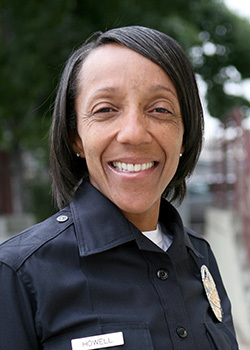 Her experience includes Central Division where she patrolled the Skid Row area, 77th Jail Division, Collision Investigator in South Traffic Division, and an Auditor at South Traffic for Collision Investigation Follow-up Unit. Patterson enjoys educating the public on traffic safety and speaking with youth about their decision making as young adults and the impact it has on their future. 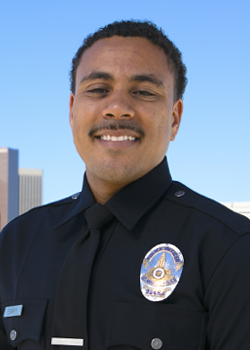 Before becoming a Los Angeles Police Officer, Patterson was a school bus driver for six years. She loves to see people win in life and overcome obstacles they thought were impossible. Patterson’s outside hobbies include event planning and spending time with her family. Mentors are assigned based on the candidate's last name. 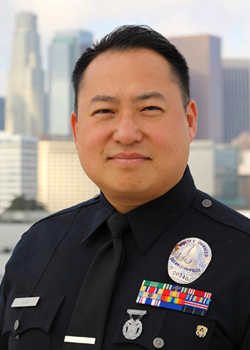 Originally from Los Angeles, Officer Suk has 13 years on the job. His experiences include patrol in Van Nuys and Olympic Divisions, Collision Investigation in South Bureau, Narcotics Investigation, Community Relations, Use of Force Review, and is currently on the patrol rifle cadre. He is a US Army veteran and was deployed to Operation Iraqi Freedom from 2003 to 2005. He developed a love for serving and helping people at a young age while working at the Koreatown Youth and Community Center. He joined LAPD because he was drawn to the noble idea of protecting the innocent, defending the weak, and bringing peace to disorder. His favorite assignment was Narcotics Enforcement Detail where he worked undercover in a tight-knit team that investigated and arrested drug dealers. He treasures the camaraderie and life-long friendships that were built throughout his career. He still remembers the help and guidance that he received from officers while going throght his hiring process and wants to provide the same help to others who are interested in becoming an LAPD officer. Spirituality and family are the most important priorities in his life. He loves spending time with his wife and two children, and volunteers regularly at church. He has an interest in the film industry and produces videos for Recruitment Division. Aaron Sorkin is his favorite screenwriter and his all-time favorite movie is “A Few Good Men." Officer Johnson was born in Washington, D.C. and grew up in Virginia. He served in the Marine Corps 12 years and was assigned a highly coveted position at the American Embassies in Warsaw, Poland, and Manama, Bahrain. He is a combat veteran and served in Operation Iraqi Freedom II in Al Asad Iraq. Officer Johnson has been on the job for 12 years. Worked Central Division and the Valley (North Hollywood). He has worked Narcotics for Central Bureau (Chase Team), Safer City Initiative, and currently is assigned to the Recruitment Division. In Recruitment, he has worked various sections including: Backgrounds, Military and College Recruitment, and most recently, the Mentor section. He enjoys being part of the molding process for the Los Angeles Police Department, rich in tradition and held in high regard for it's training and tactics. Officer Johnson encourages candidates in the hiring process and informs them of all the opportunities offered to those seeking employment. Aside from mentoring candidates, Officer Johnson has worked with at risk children in South Los Angeles, creating an after school program to keep kids off the streets and out of gangs. He enjoys music production and photography, as well as traveling the globe. 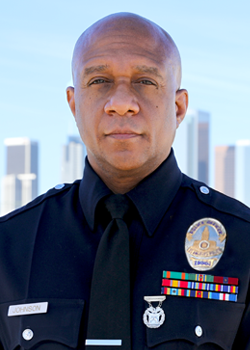 Originally from Los Angeles, Officer Gourdine has spent over 18 years on the force. Some of his experience includes patrol in Harbor Division, narcotic and vice detail, detective work focusing on auto-detail, CRASH - gang detail, and the Kids and Cops Program. One of his fondest memories of his time on the force was serving a search warrant, from a helicopter, on stolen cars found in a suspects backyard. He especially enjoyed his time at Harbor Division because of the great weather. He recommends that candidates go on a ride-along to experience what the job is really like. For candidates that think this job is too dangerous, he says that radio and report writing are 80% of the work. Considering himself a candidate advocate, he deeply connects to candidates going through the process and wants them to succeed. Despite the fact that he never shot a gun before the academy, he was able to master the craft, and breezed through thanks to his experience running long distances in college. He is a big fan of the movie "42" - about Jackie Robinson, loves landscaping, and enjoys soul-food. 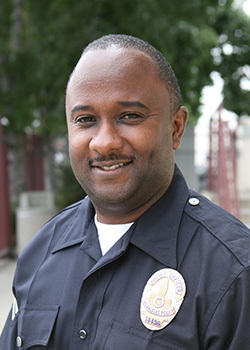 Originally from South Los Angeles, Officer Miller came to the LAPD after spending 6 years with the Airport Police, and has now been on the force for over 16 years. Some of his experiences have included patrol in West LA and the Southwest division, mentoring at-risk youth in the Jeopardy program, and playing on the LAPD basketball team. Officer Miller knew from an early age that he was interested in a career in law enforcement, and persued a degree in Criminal Justice to reach that goal. He enjoys watching UCLA basketball and USC football. He's also a big fan of Mexican food and Batman (he really enjoyed the Dark Knight). He says perseverance and compassion is key in all areas of law enforcement. Officer Miller believes in mentoring our youth and mentors young basketball players in his spare time. While playing Forward/Center for the LAPD basketball team, he has competed against other police teams in many different countries and enjoys learning about different cultures. He finds gratification in the positive impact he has on others through his work in the Recruitment Division. 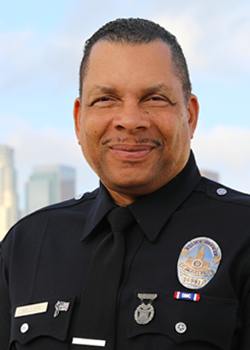 Originally from Los Angeles, Officer Howell has spent over 23 years on the force. Some of her experiences have included patrol in Wilshire (where she grew up), vice detail, and the D.A.R.E. program. She says patrol was great because she had a wonderful partner and was able to use the relationships she had built in the community. When she joined she was actually a licensed cosmetologist, but after watching the tv series 21 Jump Street, she knew she wanted to be a cop. Initially her family was against it, but in the end her family supported her and was extremely proud when she got hired. The Candidate Advancement Program helped her through the process because she needed to lose weight and it helped her get in shape. Dealing with a lot of candidates that get held up in the medical portion of the screening process, she sends candidates to a nutritionist and has seen some candidates lose over 35 pounds! She really gets excited for candidates who take control of their issues and persevere. Some of her iterest include shopping (she's an avid coupon clipper), pizza (she loves Victor Jr's in Culver City), Tyler Perry movies, and Redondo Beach. Her toughest call on patrol was restraining a 4'11" 90lb Olympic gymnast.